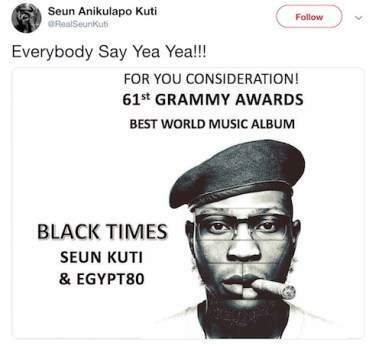 Afrobeat singer, Seun Kuti has been nominated for the 61st edition of the Grammy awards. The youngest son of Fela Anukilapo-Kuti got the nomination for his album "Black Times". His nomination under the world music category. The award nominations was announced today. The 2019 Grammy awards is set to hold on February 10, 2019 at the Staples Center in Los Angeles.